Self-adhesive magnetic clasps by MAUL to hang up important information, such as drawings, notes, maps, pictures or posters. 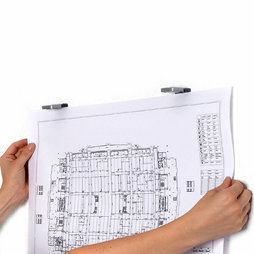 Just insert the material into the clips and they automatically snap shut - hence even large plans can be hung up by one person. Ideal for office, workshop or business use. Thanks to the self-adhesive backside, clips can be used on any smooth surface. They are easily removable and reusable and don't leave any marks. The convenient snap-shut model is an essential office accessory. The magnetic clips are available in three colours: silvery, blue and grey. The magnetic clips are delivered in a cardboard box in a set of 10.